Luang Por Ajahn Sumedho is the senior Western representative of the Thai forest tradition of Theravada Buddhism. He was abbot of Amaravati Buddhist Monastery just north of London from its consecration in 1984 until his retirement in 2010. Luang Por means Venerable Father, an honorific and term of affection in keeping with Thai custom; ajahn means teacher. A bhikkhu for 45 years, Sumedho is considered a seminal figure in the transmission of the Buddha’s teachings to the West. 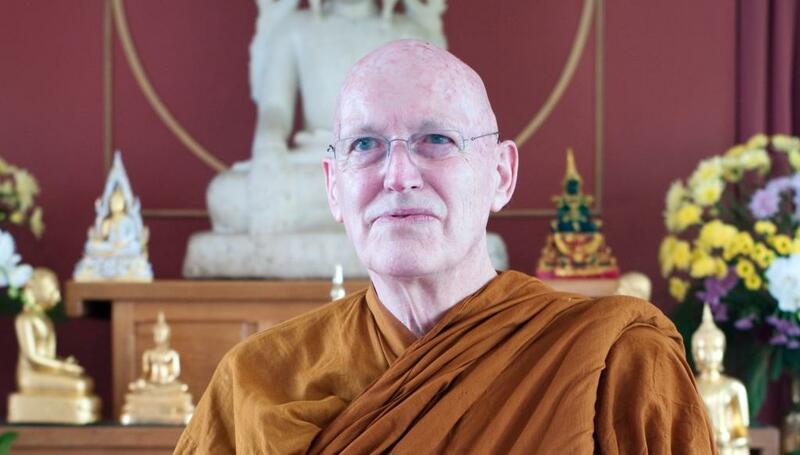 Ajahn Sumedho was born Robert Jackman in Seattle, Washington in 1934. During the Korean War he did military service for four years from the age of 18 as a United States navy medic. He then did a BA in Far Eastern studies and graduated in 1963 with an MA in South Asian studies at the University of California, Berkeley. After a year as a Red Cross social worker, Jackman served with the Peace Corps in Borneo from 1964 to 1966 as an English teacher. On break in Singapore, sitting one morning in sidewalk café, he watched a Buddhist monk walk by and thought to him self, “That looks interesting.” In 1966 he became a novice or samanera at Wat Sri Saket in Nong Khai, northeast Thailand. He took profession as a bhikkhu in May the following year. From 1967-77 at Wat Nong Pa Pong, trained under Ajahn Chah. He has come to be regarded as the latter’s most influential Western disciple. In 1975 he helped to establish and became the first abbot of the International Monastery, Wat Pa Nanachat in northeast Thailand founded by Ajahn Chah for training his non-Thai students. In 1977, Ajahn Sumedho accompanied Ajahn Chah on a visit to England. After observing a keen interest in Buddhism among Westerners, Ajahn Chah encouraged Ajahn Sumedho to remain in England for the purpose of establishing a branch monastery in the UK. This became Cittaviveka Forest Monastery in West Sussex. Ajahn Sumedho was granted authority to ordain others as monks shortly after he established Cittaviveka Forest Monastery. He then established a ten precept ordination lineage for women, “Siladhara”. Ajahn Sumedho’s imminent retirement was announced in February 2010, and he retired in November of that year. His successor is the English monk Ajahn Amaro, hitherto co-abbot of the Abhayagiri branch monastery in California’s Redwood Valley. Ajahn Sumedho now dwells as a “free agent” in Thailand. Ajahn Sumedho is a prominent figure in the Thai Forest Tradition. His teachings are very direct, practical, simple, and down to earth. In his talks and sermons he stresses the quality of immediate intuitive awareness and the integration of this kind of awareness into daily life. Like most teachers in the Forest Tradition, Ajahn Sumedho tends to avoid intellectual abstractions of the Buddhist teachings and focuses almost exclusively on their practical applications, that is, developing wisdom and compassion in daily life. His most consistent advice can be paraphrased as to see things the way that they actually are rather than the way that we want or don’t want them to be (“Right now, it’s like this…”). He is known for his engaging and witty communication style, in which he challenges his listeners to practice and see for themselves. Students have noted that he engages his hearers with an infectious sense of humor, suffused with much loving kindness, often weaving amusing anecdotes from his experiences as a monk into his talks on meditation practice and how to experience life (“Everything belongs”). A meditation technique taught and used by Ajahn Sumedho involves resting in what he calls “The Sound of Silence”. He talks at length about this technique in one of his books titled “The Way It Is”. Ajahn Sumedho said that he was directly influenced by Edward Salim Michael’s book : The way of inner vigilance (republished in 2010 with the new title : the Law of attention, Nada Yoga and the way of inner vigilance” and for which Ajahn Sumedho wrote a preface). The “Sound of Silence” is also the title of one of Ajahn Sumedho’s books (published by Wisdom in 2007). In his book, the “Sound of Silence,” he mentions that it was not directly influenced by his study of Ven. Hsu Yun’s works or by the Shurangama Sutra, though he has heard that the Shurangama mentions a similar practice.